Description - USFloors COREtec Plus is an evolution in luxury vinyl flooring. Being an entirely new category of flooring called Engineered Vinyl Plank flooring or, EVP for short, these planks and tiles are by far the most durable on the market today. These planks are constructed with the same materials other luxury vinyl planks are, but feature a waterproof inert core. This patent-pending Hydracore, which is constructed of recycled wood, bamboo dust, limestone and virgin PVC, is so waterproof that it can be submerged underwater for months and never swell. And since these vinyl tiles are inert, meaning they will not expand or contract, the need for expansion strips around your room is totally eliminated. COREtec also features a cork underlayment, making it softer, quieter and warmer than standard wood flooring and is backed by a lifetime warranty. Size – USFloors COREtec Plus 5 Engineered Vinyl Planks are 5" x 48". Weight – 5" wide planks weigh 2.63 Lbs each. 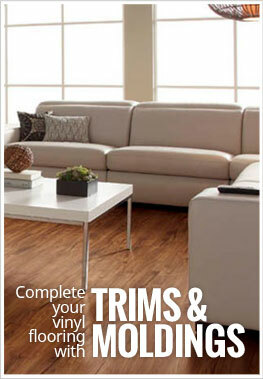 Recommended Uses – USFloors COREtec Plus vinyl planks and tiles have been built with long lasting durability in mind. 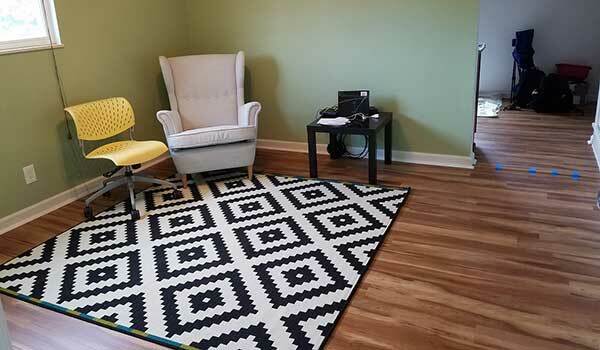 These engineered vinyl planks have been designed for both commercial and residential use and are perfect for living rooms, kitchens, dining rooms, basements, laundry rooms, bathrooms, bedrooms, playrooms, family rooms, dens, garages, offices and many other areas of your home or business. Waterproof and will not expand or contract. Softer, warmer and more quiet than hardwood flooring. COREtec Plus 5” planks are 5” wide by 48” long and are the perfect finish to any room. These beautiful engineered vinyl planks come finished with a 4 sided micro bevel edging, enhancing the natural wood look you’re sure to love. WIth an assortment of popular and attractive colors, we are sure you’ll find your new favorite flooring in COREtec Plus. We are building a house in Colorado and we will have in floor hydronic heat. Can we install this product with this in floor heating system? COREtec Plus can be installed over radiant heat using the floating pr glue down method. Turn the heat off for 24 hours before, during and 24 hours after installation when installing over radiant heated subfloors. Floor temperature must not exceed 85°F (30°C). What type of rugs are recommended on Coretec wood look floors? It is recommend that non-staining vinyl-backed mats or woven rugs are to be used on vinyl flooring. Never use rubber-backed or latex-backed mats as they can permanently stain your floor. How do you care for it? what products used in cleaning? Thanks. Just finished putting Coretec down in our basement remodel. We have a large oak roll top desk. I am concerned about it leaving dents. Will dents appear? What do you suggest for padding under the desk? On another note. What is the best way to move the desk across the flooring? While it is unlike that the COREtec floor will dent under weight, we do recommend using felt furniture pads to protect your floors from damage often caused by scratching of furniture. Don't push or pull items across the floor. If possible, use an air sled or even a dollie to move heavy items. You can also place plywood sheets down first and move the object over the plywood sheets. Some manufacturer spec sheets include the plank repeat count. You just would have to find the spec sheet if it is available. Typical pattern repeats are around 7 or 8 planks. Product looks great. Self install was pretty straight forward. Product locks together pretty good. Seems very scratch resistant. Had one scratch and after rubbing with a damp rag it disappeared. Love it so far. Feels solid under foot. 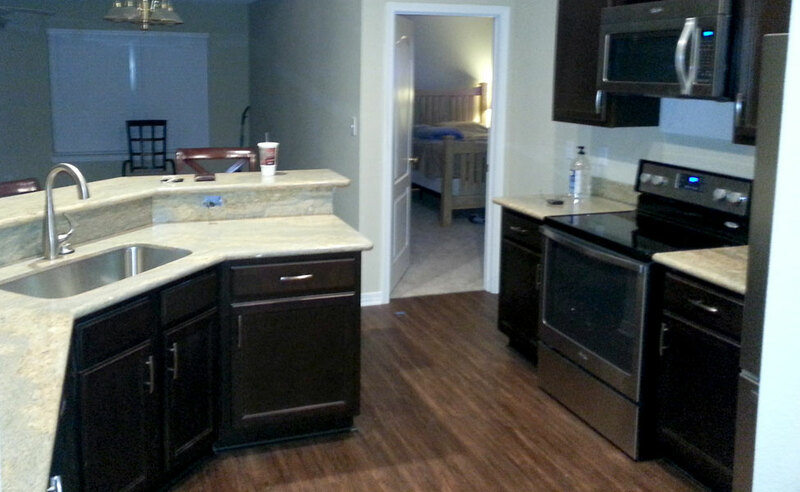 The flooring is fantastic! I installed it in the basement without the help of a contractor and it was pretty easy. There are a variety of patterns in the wood with no repeats across the floor. I recommend this product and would definitely use it again. Customer service was good. I didn't need the flooring delivered immediately, so the representative worked out a delivery schedule to suit my time frame. 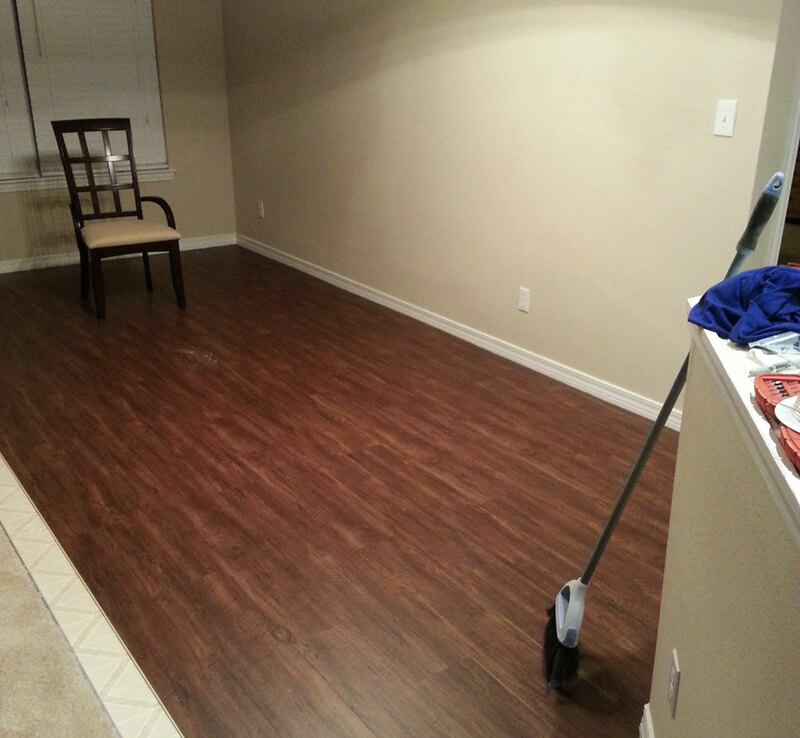 I removed the old floor, prepped, and installed the new floor by myself in less than 4 days. I chose this brand for its looks, but it was tad less easy to install than a different laminate for another project. However, I think it turned out well; here's a photo so you can judge for yourself. Just had the Carolina Pine COREtec Plus floor installed in one of the bedrooms. It looks great and feels real nice under your feet. It is much quieter than the laminate we have in the hallway adjoining this bedroom. It does look a lot like wood with a slightly duller appearance. I am hoping it holds up the way it is promoted as I am seriously considering installing it throughout the house.